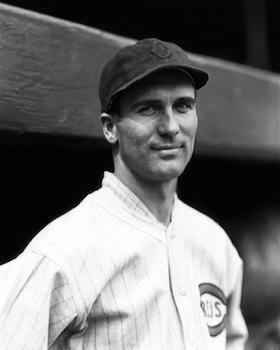 Pinky Pittenger was a backup infielder who played for three major-league clubs during the decade of the 1920s. He picked up the name Pinky from a comic-strip character of the day. It was perhaps better than Clarke Alonzo Pittenger. That’s the name he was born with, son to William J. and Anna (Gray) Pittenger, born on February 24, 1899, in Hudson, Michigan, a small town about 90 miles west and south from Detroit. The family moved to Toledo when Clarke was five years old. William worked as a molder and by 1910 had become a foreman in a Toledo foundry. At the time Pittenger registered for the draft in World War I, he was enrolled as an engineering student at Toledo. His military service was brief – with the Students Army Training Corps (SATC), from October 14, 1918, to his honorable discharge as a private in December. Pittenger’s first time in professional baseball came in 1919; he played two seasons at third base for the London, Ontario, team in the Class-B Michigan-Ontario League. He hit .303 and .315, with two home runs each year, in 92 and 110 games respectively. He was fast on the basepaths, too, stealing 30 bases in 1919 and 36 in 1920. Nonetheless, Pittenger was used sparingly at first. He got into one game in April, as a pinch-hitter, one in May, and two in June, in late-inning defensive work or as a pinch-runner. Entering July, he still hadn’t made his first major-league hit but he’d had only one plate appearance. In the first game of the Fourth of July doubleheader, he got a couple of at-bats and singled once. His first multi-hit game came on July 15, when he was 2-for-3, and then he upped that the very next day with a 3-for-5 afternoon. It wasn’t until July 27 that Pittenger got his first RBI. It came on a sacrifice fly, giving the Red Sox their third run in a 5-4 win over Cleveland. Though typically an infielder, Pittenger was used more often in the outfield in 1921. He got into 40 games in all, with 98 plate appearances. He hit for just a .198 average, and had only five RBIs. He made only one error in 80 fielding chances. He had just one extra-base hit, a double. Pittenger played only a part of a game in the outfield in 1922, and was otherwise an infielder, splitting his time between shortstop and third base. He was used in 66 games, collecting 203 plate appearances and hitting .258 (.299 on-base percentage). He upped his extra-base hit total to three; he was thrown out in five of the seven times he attempted a steal. Despite the additional 105 plate appearances, Pittenger drove in only two more runs. And he made 22 errors in the field – committing errors more than 8 percent of the time. Most of Pittenger’s 60 games in 1923 were in the final three months of the season; he was in only 11 games before July 7. Before the season began, the Boston Herald’s Ed Cunningham had observed, “He came up in 1921 and showed remarkable promise. He should have been sent out to some minor league for campaigning instead of being kept on the bench, merely filling in as a utility man for two seasons. As a result, he has not made much progress.”8 As Pittenger himself put it, “I was sort of a fifth wheel in the Boston infield for a couple of years.”9 Despite a strong arm, Cunningham continued, “His chief fault in his throwing.” In fact, the Red Sox had tried to send him to Toronto in 1922 but other American League clubs blocked the attempt. In 1923, in those 60 games, Pittenger’s hitting fell off, back to .215 with only a .236 on-base percentage. He was more productive, though, driving in 15 runs. Three of them came in the second game of the July 15 doubleheader in St. Louis, enabling the Red Sox to tie the game, 6-6. And his fielding was markedly improved, with only eight errors in 217 chances. Within a couple of days, Pittenger came around – more or less hoping that since he was on 48-hour recall, he would indeed get recalled to Chicago. He opened the season with Los Angeles and appeared in four games, with a total of just one hit, a single, due to a wrenched knee that kept him out of action. After the midpoint of May, Pittenger was sent back to Chicago. Cubs president William L. Veeck said there wasn’t any real significance to the move; he was, after all, Cubs property.14 Pittenger’s first appearance in a Cubs game was on May 25. He played mostly third base in June and mostly shortstop in August and September, getting into a total of 59 games and having considerable success at the plate – hitting for .312 and driving in 15 runs. Pittenger played a full 162 games in the American Association for the 1926 Louisville Colonels. On September 14 his contact was sold conditionally to the Cincinnati Reds. He had, the Associated Press reported, “batted consistently around the .300 mark all season, and has been the steadying factor in the Louisville drive for another pennant.”18 The Colonels won the pennant by 11 games. Three more seasons passed, Pittenger playing for the Reds, always in a backup role. He appeared in 31 games, then 40 in 1928, and half the games – 77 – in 1929. He was used differently in the three years. He hit .274 in 90 plate appearances in 1927, playing for a month and then not again until September, when he was used exclusively at second base. In the May 12 game he went “down in a heap as his left leg crumpled under him.”19 He was hitting .273 before the injury; he finished the season at .274, including a home run on September 11, part of a 4-for-4 day with four RBIs. It was the only homer Pittenger ever hit in the majors; Boston’s Hugh McQuillan was the victim. In 1928 Pittenger played in 40 games for the Reds but had only 38 plate appearances. In 20 of the games he was used exclusively as a pinch-runner. In one game he pinch-ran and then played briefly at shortstop. He hit .237 and had just four RBIs. Pittenger was called on more frequently in 1929, with 227 plate appearances, and he hit for a very good .295 batting average, driving in 27 runs. It had looked as though he’d won the third-base starting slot, but manager Jack Hendricks soon gave most of the work at third to Chuck Dressen. After baseball, Pittenger lived in Toledo and worked as proprietor of the Ottawa Tavern and then the Westmoreland Inn, a restaurant. He refereed football and basketball games for more than 20 years. There was a second marriage, on December 19, 1942, to Florence Ehrhardt. He also worked as an examiner for the driver’s license division of the state highway patrol, and as a real-estate salesman for Great Lakes Homes, Inc.
Later in life, Pittenger moved to Fort Lauderdale, Florida, and owned a nightclub there until his death of a stroke at the Manor Oaks Rest Home at Fort Lauderdale on November 4, 1977.23 He was survived by his first wife, Margaret, and the two children he had with her, Clarke Jr. and Duane. In addition to the sources noted in this biography, the author also accessed Pittenger’s player file and player questionnaire from the National Baseball Hall of Fame, the Encyclopedia of Minor League Baseball, Retrosheet.org, Baseball-Reference.com, and the SABR Minor Leagues Database, accessed online at Baseball-Reference.com. 1 Muskegon (Michigan) Chronicle, July 4, 1922. 2 Bay City (Michigan) Times, August 4, 1920. 3 Winston-Salem (North Carolina) Journal, March 27, 1921. 4 Saginaw (Michigan) News, April 10, 1921. 5 Boston Herald, February 12, 1922. 6 Muskegon Chronicle, July 4, 1922. 7 Boston Herald, March 19 and 27, 1923. 8 Boston Herald, April 15, 1923. 9 The Sporting News, December 28, 1968. 10 Boston Herald, December 16, 1923. 11 The Sporting News, December 28, 1968. 12 Seattle Daily Times, March 30, 1925. 13 Chicago Tribune, March 31, 1925. See also the Los Angeles Times of April 1. 14 Los Angeles Times, May 22, 1925. 15 Chicago Tribune, July 11, 1925. 16 Lexington (Kentucky) Herald, December 29, 1925. 17 The Sporting News, December 28, 1968. 18 Washington Post, September 15, 1926. 19 New York Times, May 13, 1927. 20 New York Times, February 16, 1930. 21 Unattributed newspaper clipping dated August 11, 1932, located in Pittenger's Hall of Fame player file. 22 The Sporting News, December 28, 1968. 23 Daughter-in-law Patricia Pittenger wrote in an email on September 3, 2014, that her husband, Clarke, had died in 1997 and Duane in 2013.